Arcam HDA Series SA10 Intergrated Amplifier. Available with Online Finance and Free Delivery. 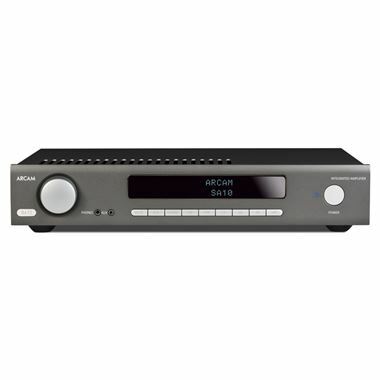 The Arcam SA10 amplifier is an ultra-low distortion type Class A/B amplifier similar to the A19. The SA10 has 5x analogue inputs (1x line/MM switchable) and 3x digital inputs (2x SPDIF and 1x optical). The ESS Sabre 9016 DAC is built into this amplifier for optimum low jitter digital performance. The SA10 is 50wpc into 8 ohms (both channels driven). The SA10 also comes with a brand new learning backlit infra-red handset and can be now controlled over IP by ARCAM’s IOS app, Musiclife or by RS232. A singer’s sharp intake of breath before hittingthe chorus; a guitarist’s fingers sliding against the strings – it’s those seemingly minor details that can bring music to life. Fish out one of your all-time favourite albums and play it through a Bluetooth speaker, and guess what? Its sounds like a Bluetooth speaker. Play it through the SA10, and it’s as close to hearing the artist’s performance as you’re likely to get. There’s always joy in digging out an old recording you haven’t heard in years. With the HDA range, it’ll feel like hearing it for the first time.